​We are eager to share our Christian experience with you. As Lutherans, we are part of a proud worship tradition affiliated with the ELCA, the Evangelical Lutheran Church in America. But, we are much more. We constantly strive to understand the needs of the diverse community that surrounds us. We reach out with Christian love and compassion. And, importantly, we are always available to serve you, your family, our community, our nation, and the world around us. We strive to provide a worship experience that suits your preferences at a location that is convenient. We provide traditional liturgical worship as well as a more contemporary music-centered worship format — both formats at our Suntree campus as well as our Melbourne Beach campus. You can choose! ​Are you ready for a visit? Of course, there are two ways you can visit us. Call us and let us know you'll be attending. We can answer your questions in person and make certain you know exactly what to expect. Our phone numbers are 321.259.8515 (Suntree) or 321.727.1724 (Melbourne Beach). On your first visit, it’s best to arrive about 15 minutes early, or 30 minutes early (on Sundays) if you need time to locate our nursery. Our worship schedule is explained on the "pop-up tab" found on the bottom of this page (or by clicking here), although we occasionally change this schedule for special holidays. Each service at Suntree has the same sermon - only the worship format and music changes. Melbourne Beach's weekly sermons differ from those delivered at Suntree. Here's a special offer for newcomers! ​At the Suntree campus ALIVE is Advent's "buddy-system," a commitment by our Members to ensure that every newcomer "knows the ropes." We pair newcomers with a veteran Member who can make certain your questions are answered and your needs met. Of course, we'll introduce your ALIVE partner whenever you are ready — including right now! Just let us know if you are interested by filling our the form below and click submit. It's as easy as that! I am interested in the ALIVE partner program! TIP: Though our Wickham Road church building is easy to spot, locating the entrance to our parking lot requires you to turn north on Forest Lake Drive, go .10 mile and turn left into our main parking Lot entrance (opposite Westlake Road). Click here to see an image. 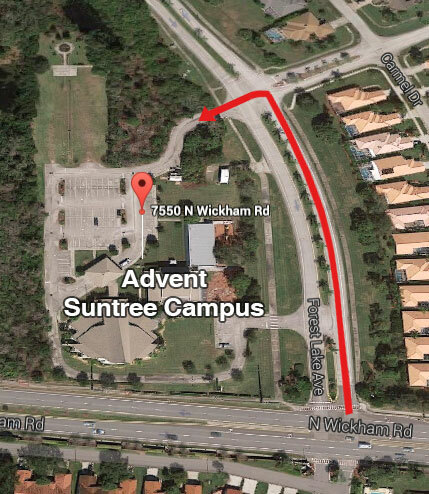 Tip: Our Melbourne Beach church building is easy to find, located midway along the "A1A shortcut," a few blocks northwest of Gemini Elementary School and the athletic fields. ​Advent Lutheran is affiliated with the Evangelical Lutheran Church in America. For more information about the ELCA, click here.